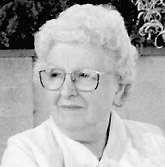 Birth* She was born on 16 January 1913 in Toronto, York County, Ontario, Canada. Death* Isabel Ellen Kennedy died on 18 August 1913 in Toronto, York County, Ontario, Canada. Birth* Jennett Norval (Jean) Kennedy was born on 14 January 1904 in Toronto, York County, Ontario, Canada. 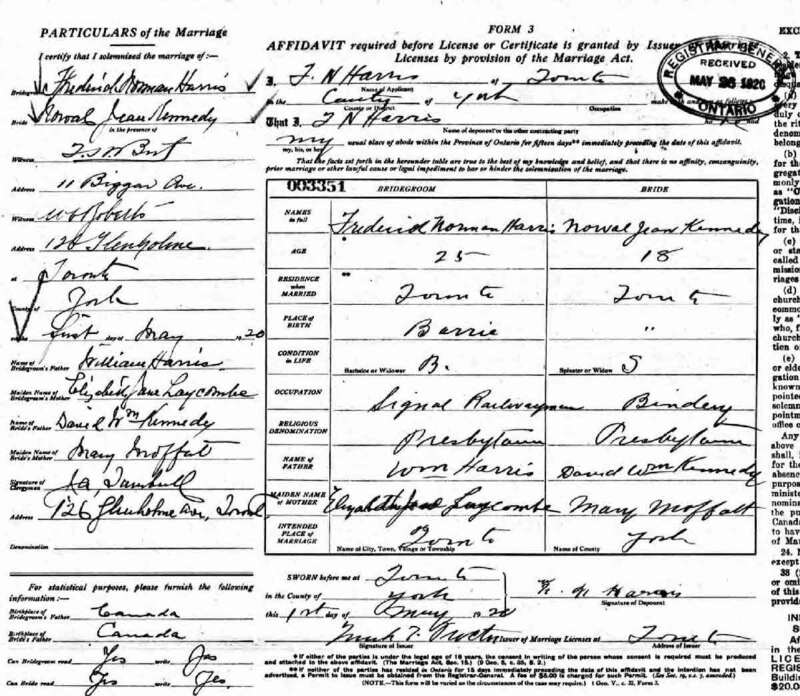 Marriage* Jennett Norval (Jean) Kennedy married Frederick Norman Harris on 1 May 1920 in Toronto, York County, Ontario, Canada. Death* John Arlington Kennedy died on 13 July 1913 in Ridgetown, Kent County, Ontario, Canada, at age 23; SAD DROWNING AT TAYLOR - John A. Kennedy Loses His Life While Bathing in the Reservoir Our citizens were shocked Sunday afternoon when the news reached town that John A. Kennedy, son of S.N. Kennedy, of this place, had been drowned while bathing at Taylor. Deceased, Who was an exceptionally clever young man, had spent practically his whole life here, and his three year connection with P. Bawden's drug store had made him known by all. His honest, courteous manner made him a general favorite. He was a graduate of the Ridgetown collegiate, and had passed the Pharmacetical Examination with such high honors that a bright future appeared before the young man. The remains were brought here when all hope of resuscitation had been given up and the funeral took place Tuesday afternoon at 2:30 from the family residence, Marsh St., to Greenwood Cemetery, Ridgetown.Services were conducted at the house and graveside by Rev. C.R. Jones. Revs. A Shore, L. Iler and S.G.Cole assisted with the service. The bearers were Ernest Lawton, Frank Lawton and Harold Mc Larty, of Ridgetown, Russell Middlemiss and Ralph Middlemiss, of Toronto and Adair Mills, of Dutton. The floral offerings were numerous and beautiful. The local lodge of Canadian Order of Foresters, of which deceased was a member, attended the funeral in a body. Besides his parents, deceased os survived by two sisters, Edna and Beatrice and one brother Robbie, who will have the sympathy of the whole community in their hour of sorrow. 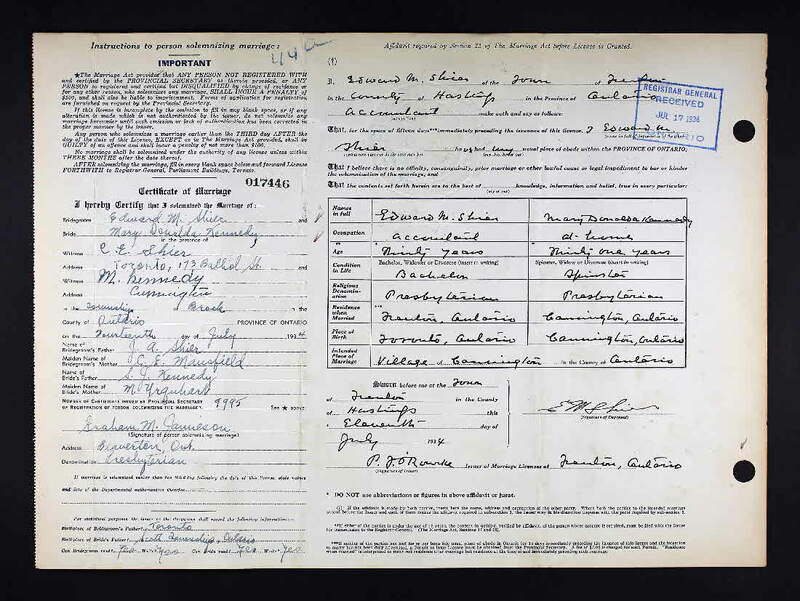 Among the persent from outside points were David and Clinton Kennedy and Mrs. Tregassess and daughter Miss May, of Toronto; Mrs. A. Howison, of Crosswell, Mich., Mrs. Chas Hills and daughter, of Detroit; Mrs. Thomas Maynard and son Calvin of Wallaceburg; Mr. J. Hooks, Mrs. Zoller, Mrs. Brown and two daughters, of Rodney, about fourty other aquaintances were present from Rodney, where deceased was extremely popular. A Rodney correspondent under date of July 14, writes as follows concerning the tragedy. John Kennedy, aged 23, son of S.N. Kennedy, of Ridgetown, was drowned in the pond at Taylor three miles west of this place, yesterday afternoon while in bathing with several other young men and boys. The bathers were swimming across the pond when Kennedy was seized with cramps and sank. He did not come back to the surface again until on of his companions located him a few minutes later, and, diving after the body brought it to the surface with difficulty, as Kennedy's hand had become entangled in the weeds at the bottom. The three youths with Kennedy at the time were Fred Boulton, accountant in the Royal bank here, Charles Ludy son of Constable Ludy, and Chas. Bake, son of H.D. Bake manager of the Bell telephone Company. Taylor Pond is an old gravel pit, and is over twenty feet deep in places. It is in close proximity to the M.C. R. tracks and within the company's right of way. A good swimming spot, though treacherous for inexperienced swimmers owing to its depth. The four yound men decided to go out for a "dip" shortly after dinner. all were within ten feet of the far shore when young Kennedy was seized with the cramp and sank in a second. Seeing him disappear, Boulton, Ludy and Bake hastened to his assistance and dived time after time for the body, which, owning to the weeds, was not secured for fully seven minutes. When finally located by Boulton, the young druggist's feet were some five feet below the surface of the water, the weeds forming a veritable death trap for his head and shoulders at the bottom. The body finally secured, a raft close by was immediately requisitioned, and every possible effort made to bring him back to life on top of the structure. Young Bake in the meantime secured a horse and buggy and drove at top seed to the village, returning with Dr. H. McL. Paterson. Dr. McLean, of Duart, close by, was also summoned and the two physicians took up the work of resuscitation along with the hard - working companions of young Kennedy. Two hours' untiring work on the part of the doctors, howerev, was unavailing. Life was extinct. Coroner, Dr. S.M. Dorland, of the village, pronounced an inquest unnecessary. 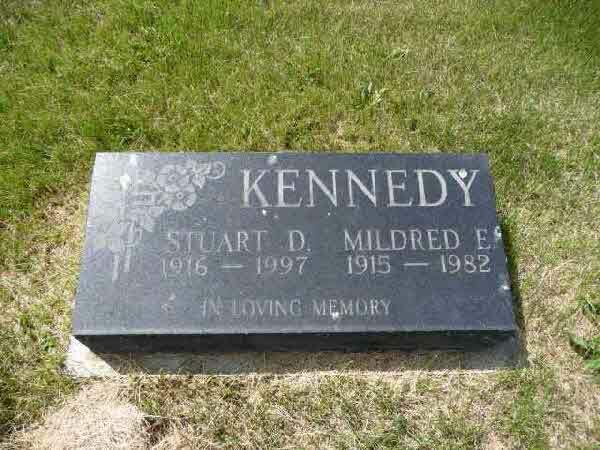 The late Mr. Kennedy was an exceptionally promising young druggist graduating as he did from the Ontario Pharmacy College in April last fifth or sixth from the top, and with first class honors, and with the degree of bachelor of Pharmacy, a signal honor. The unfortunate young fellow had been engaged to look after the business of Mr. Thompson, during the latter's absence in the old country, where he is at present with the Canadian bowling delegation. 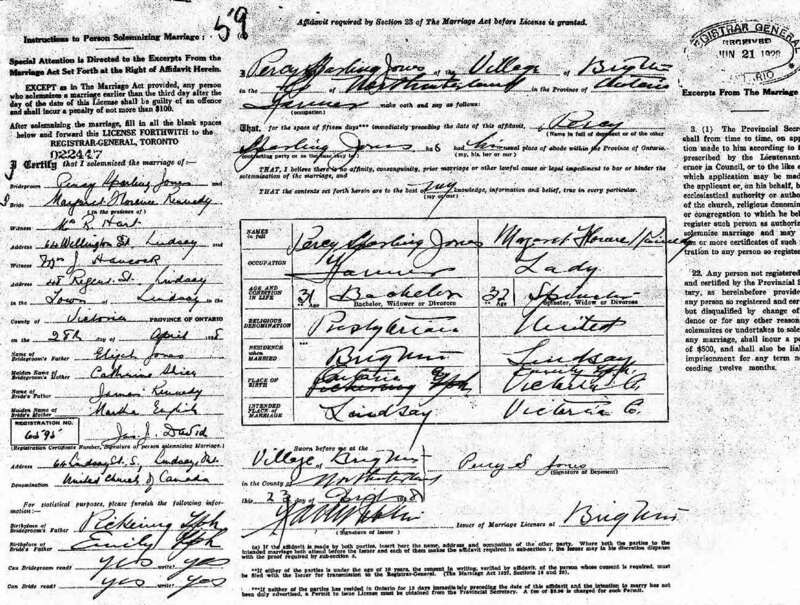 Marriage* John Burns Kennedy married Mary Ann Burrell, daughter of William Burrell and Annie Unknown, on 27 December 1893 in Toronto, York County, Ontario, Canada. Death* John Burns Kennedy died on 30 March 1935 in Windsor, Essex County, Ontario, Canada, at age 71. Birth* John Edward Kennedy was born on 11 April 1901 in Toronto, York County, Ontario, Canada. 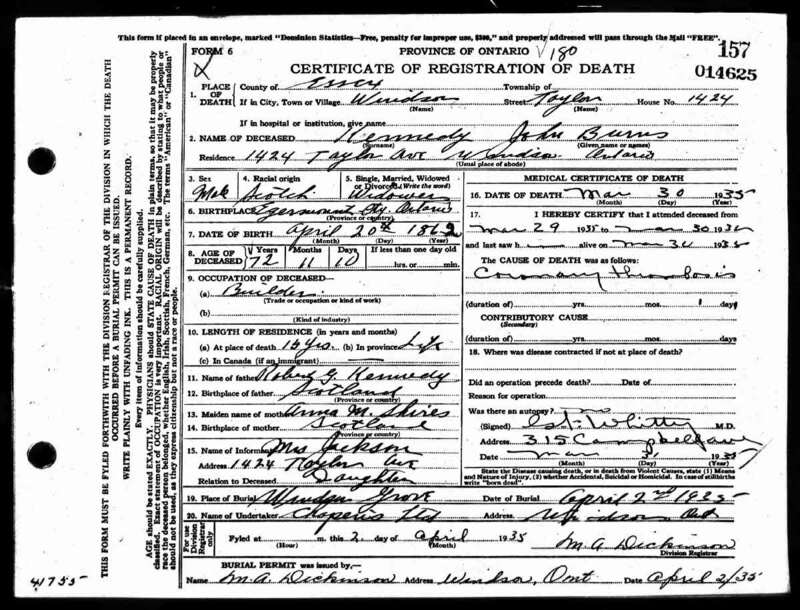 Death* John Edward Kennedy died on 25 November 1903 in Toronto, York County, Ontario, Canada, at age 2. 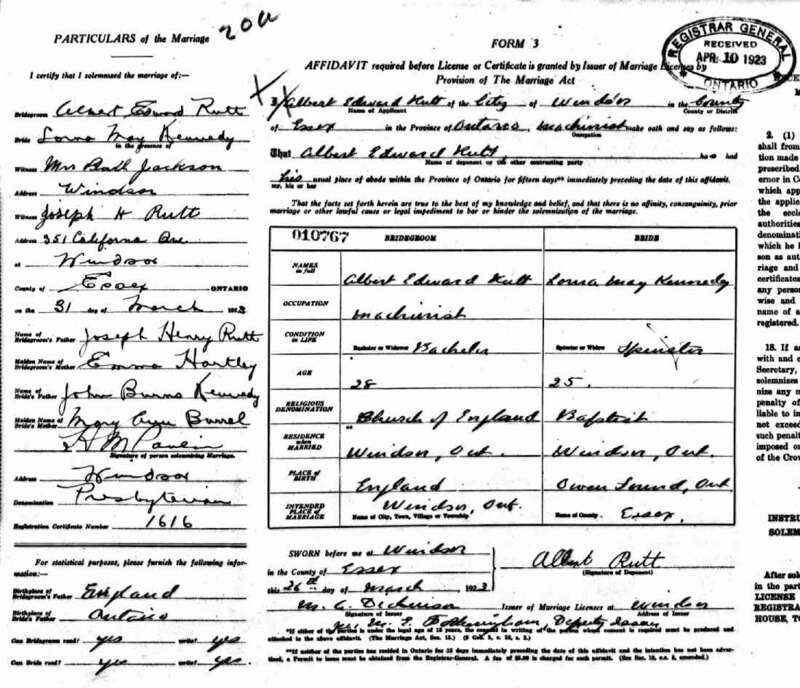 Marriage* Joseph ALBERT Kennedy married Letitia Bint, daughter of Arthur Bint and Christina Cullins, on 16 August 1919 in Toronto, York County, Ontario, Canada. Marriage* Joseph ROY Kennedy married Lillian Mae Atkinson on 14 October 1919 in Toronto, York County, Ontario, Canada; Divorced in 1925, divorce secured in Michigan. [S47] Unknown author, "E-Mail Message," e-mail message from \ (unknown address) to unknown recipient, from Beverly Lavigne. 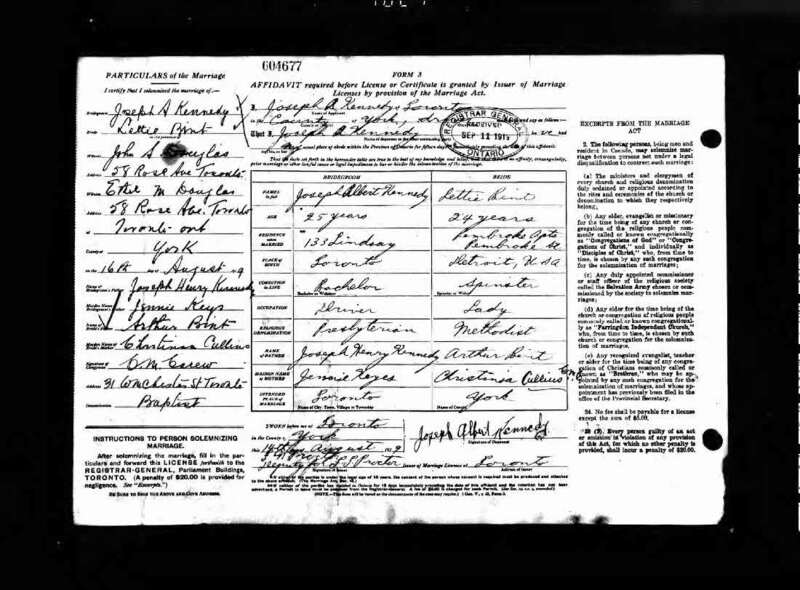 Marriage* Lorna May Kennedy married Albert Edward Rutt, son of Joseph Henry Rutt and Emma Hartley, on 31 March 1923 in Windsor, Essex County, Ontario, Canada. 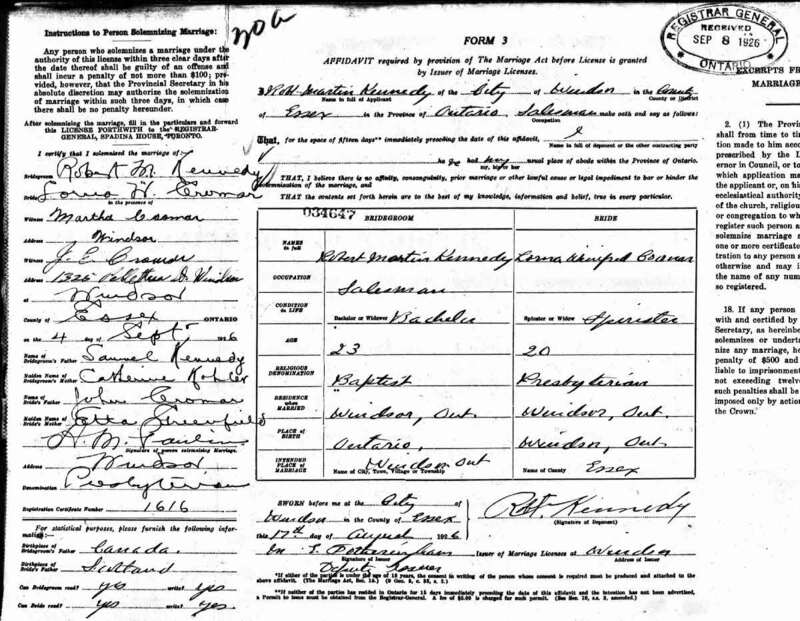 Marriage* Margaret Florence Kennedy married Percy Sparling Jones, son of Elijah John Jones and Catherine Elizabeth Shier, on 28 April 1928 in Lindsay, Victoria County, Ontario, Canada. 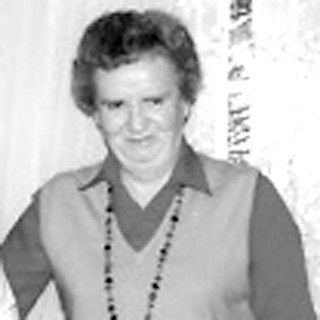 Birth* Mary Donalda Kennedy was born on 25 January 1903 in Ontario County, Ontario, Canada. 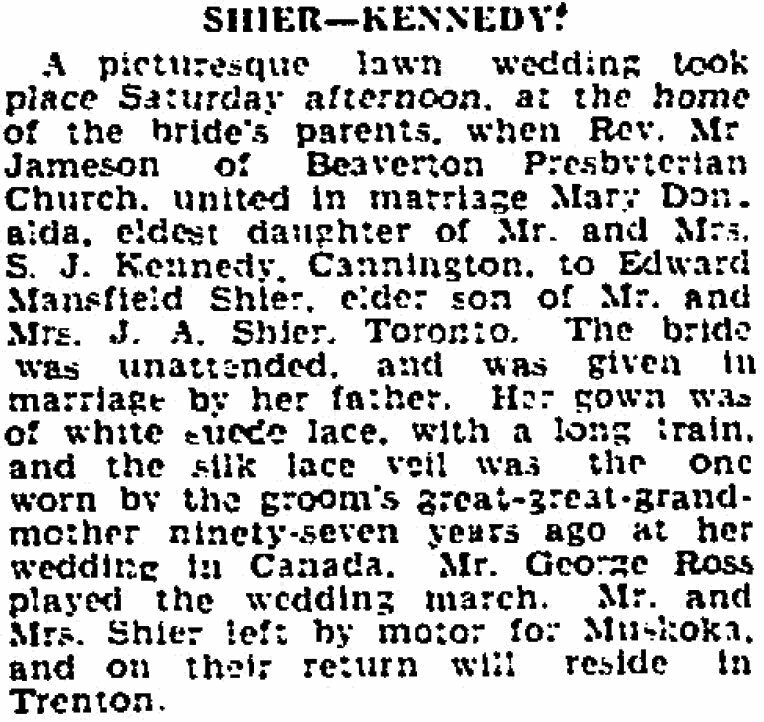 Marriage* Mary Donalda Kennedy married Edward Mansfield Shier, son of John Arthur Shier and Charlotte Elizabeth Mansfield, on 14 July 1934 in Brock Twp., Cannington, Ontario County, Ontario, Canada. [S47] Unknown author, "E-Mail Message," e-mail message from \ (unknown address) to unknown recipient, Beverley Lavigne. 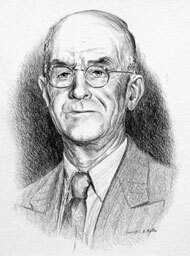 Fact 1* Induction into the Saskatchewan Agricultural Hall of Fame: Peter Hugh Kennedy, the father of field shelterbelts on the Prairies, was born in Glengarry County, Ontario. He headed west in 1904, homesteading on the bare open Prairie near what is now Conquest, Saskatchewan. Death* He died on 8 August 1888 in Toronto, York County, Ontario, Canada, at age 6; due to diptheria. 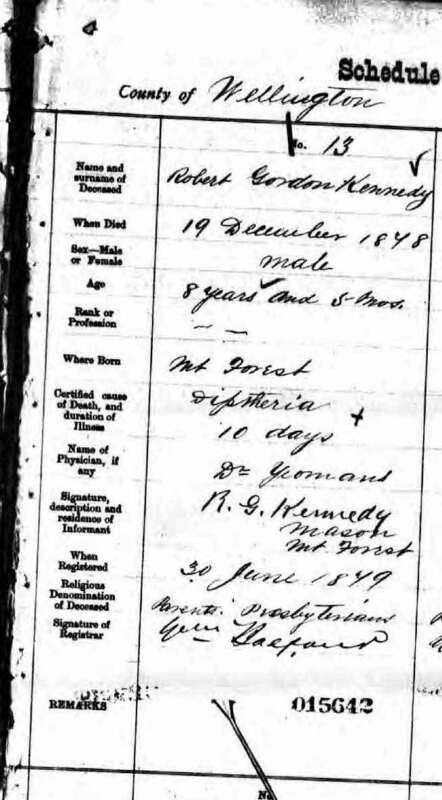 Death* Robert Gordon Kennedy died on 19 December 1878 in Mount Forest, Wellington County, Ontario, Canada, at age 8. Birth* Robert James Gordon Kennedy was born on 12 July 1891 in Toronto, York County, Ontario, Canada. 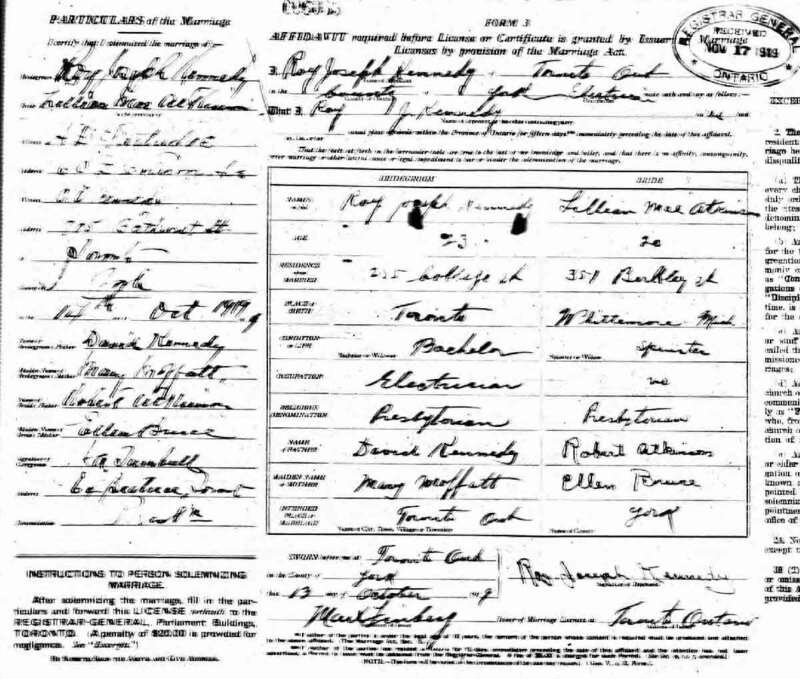 Marriage* Robert James Gordon Kennedy married Eva Ida Bardgett on 27 September 1916 in Toronto, York County, Ontario, Canada. Death* Robert Martin Kennedy died on 21 March 1917 in Brantford, Wentworth County, Ontario, Canada, at age 37; due to pneumonia. 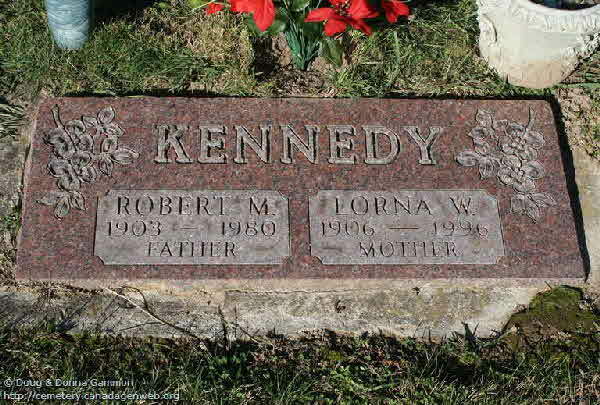 Birth* Robert Martin Kennedy was born on 24 March 1903 in Ridgetown, Kent County, Ontario, Canada. Marriage* Robert Martin Kennedy married Lorna Winnifred Cromar on 4 September 1926 in Windsor, Essex County, Ontario, Canada. Marriage* Samuel Nathaniel Kennedy married Eliza Jane Ramsay, daughter of John Ramsay and Mary J. 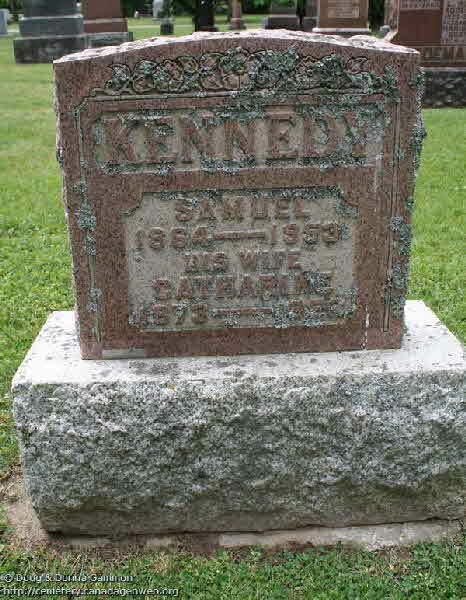 Unknown, on 12 July 1887 in Howick Twp., Gorrie, Huron County, Ontario, Canada; Samuel Nathaniel Kennedy lived in Michigan at the time of his marriage to Eliza Jane ramsay. 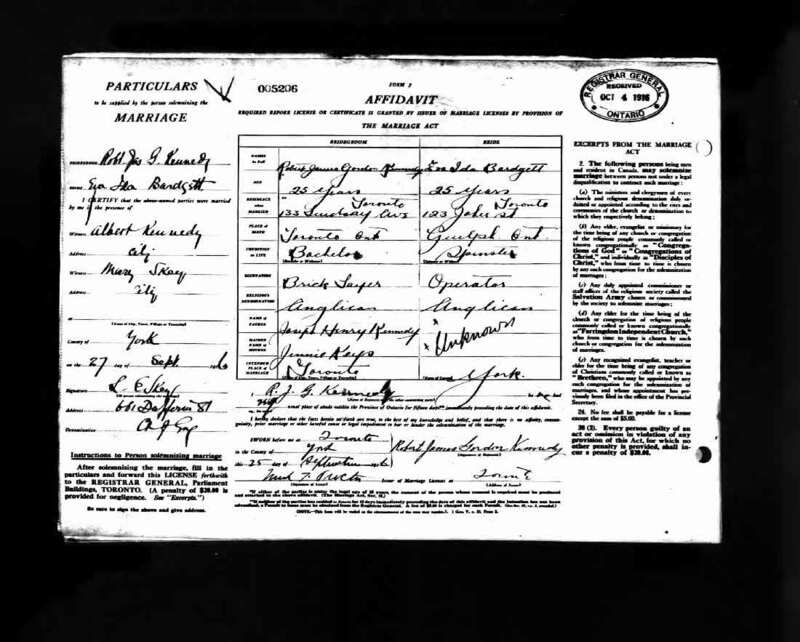 Marriage* He married Catherine Rohler on 28 October 1896 in Ridgetown, Kent County, Ontario, Canada. [S17] Unknown author, findagrave.com (n.p. : n.pub. ), Memorial # 139032341. Birth* Samuel Wilfrid Kennedy was born on 12 February 1896 in Owen Sound, Grey County, Ontario, Canada. 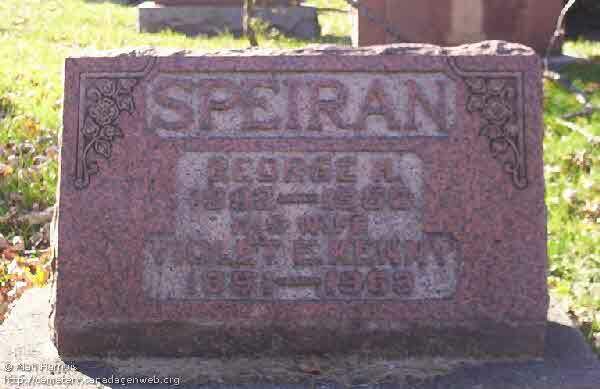 Burial* He was buried in Milden Cemetery, Milden Municipality, Saskatchewan, Canada. 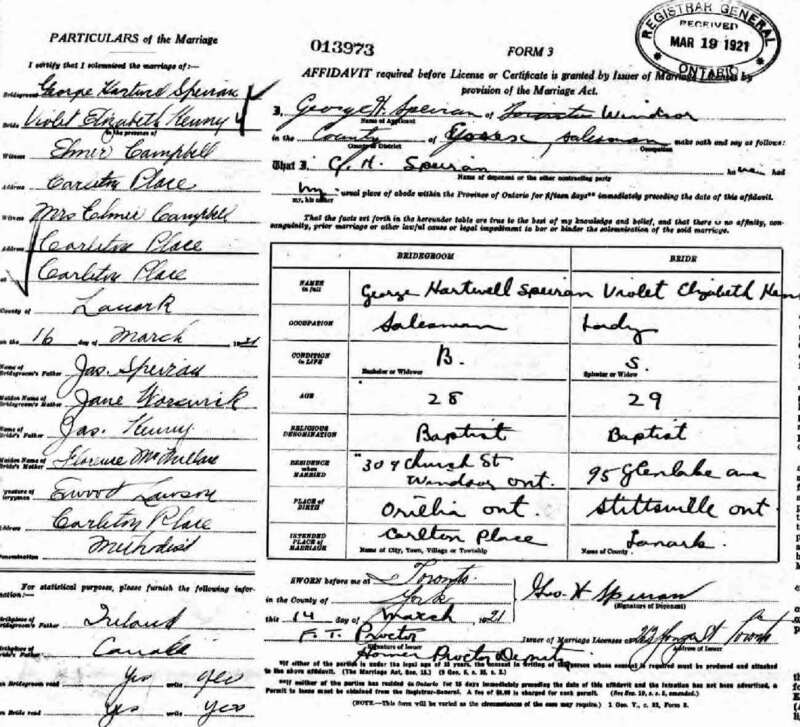 Marriage* She married George Hartwell Speiran, son of James Speiran and Eugenia Warswick, on 16 March 1921 in Carleton Place, Lanark County, Ontario, Canada. Burial* She was buried in Windsor Grove Cemetery, Windsor, Essex County, Ontario, Canada. Death* Christine H. Kerr died on 12 February 2010 at age 91; Christine Shier, 91, of Rockford, IL passed away at 10:18 pm Friday February 12, 2010 in St Annes. She was born December 27, 1918 in Indiana, PA, the daughter of Matthew and Elizabeth Kerr. She married Robert F. Shier in Detroit and they were married for 45 years. They moved to Rockford in 1970. He predeceased her in 1998. Chris was a member of Rockford Newcomers, Rockford Hospital Auxiliary, and the Ledges Women's Golf League. She was also a member of Hope Reformed Church and currentlymember of Westminster Presbyterian Church.include her daughter Reverend Lorie (Celia Meerman)Shier of Spring Lake, MI. Granddaughter McKenna Shier of Spring Lake, MI. Grandson Jon (Nicole) Vandermeulen of Seattle, WA. Two Sisters-in-law Carol Arbour of Westland, MI and Louise Shier of Port Huron, MI. Several nieces and nephews and long time familyand devoted caregivers Tom and Marion Gentry. She was predeceased bybrothers and sisters.service at 1pm Saturday February 20, 2010 in Westminster Presbyterianwith Pastor David Smazik officiating and reception following. Private family burial. Arrangements by Fitzgerald Funeral Home and Crematory 1860 S. Mulford Rd.contributions to Westminster Presbyterian Church or Northern Illinoi.